This is based on wines provided to me by the winery or organization acting on their behalf. Gary Jaffe’s wine journey started in 1980 when he took a vacation from the family’s insurance business to visit St. Helena. During the visit, Gary came to a revelation, “I decided I’d live here one day,” he said. Monthly visits to the area again opened his eyes; he could buy some land for what he was spending on hotels. Gary eventually purchased 8 acres on Pritchard Hill above LakeHennessey. This gave Gary a place for a cabin and to set up a telescope to watch the stars. A few years later, he doubled his land holdings and looked to plant grapes. In 1991, reality set in when it was estimated it would cost $100,000 per acre to plant grapes on the rocky site. Gary and Pam moved to the valley in 1999, with the addition of twin girls into their lives, the distance to town began to diminish the appeal of living at the solitary mountain site. Jaffe Estate Winery produces two estate-grown, relatively low alcohol wines, Transformation is a Bordeaux style blend and Metamorphosis is a Cabernet Sauvignon. 2005 marked the first vintage to be released. The couple was proud when their wines were added to the highly selective list at Auberge du Soleil. Jaffe Estate wines are on the wine list at several restaurants in the valley. The wines are also available direct from the winery by clicking here. 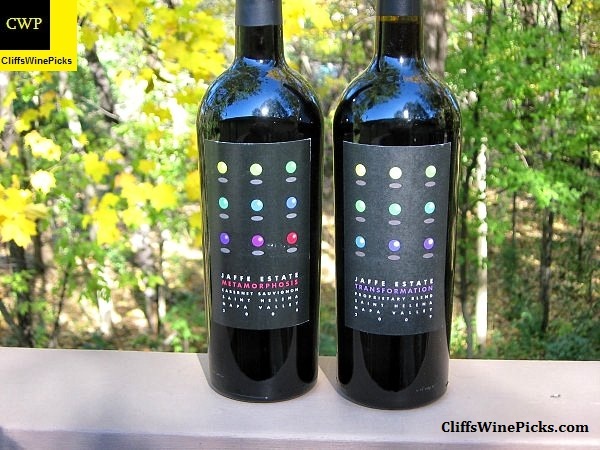 The winery has a free newsletter and “The Celestial Set” Wine Club. 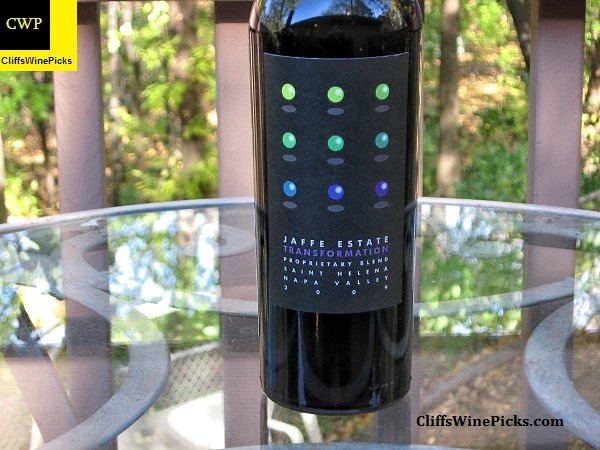 For more information on Jaffe Estate, you can visit their website, or find them on Twitter or Facebook. Metamorphosis is a 100% Cabernet Sauvignon from the estate vineyard in the St. Helena appellation. 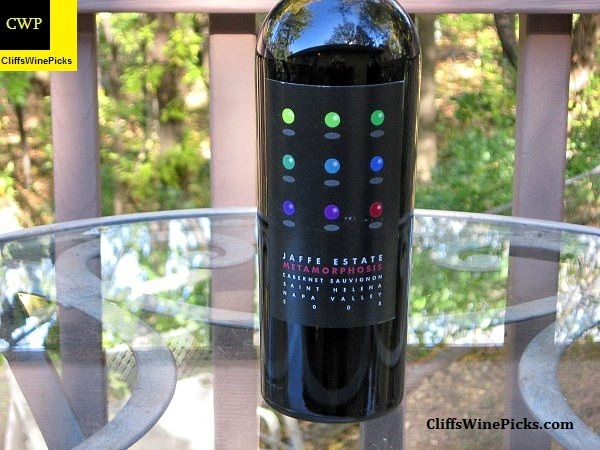 The wine is 13.8% alcohol and is sealed with a natural cork. Transformation is a blend 55% Cabernet Sauvignon and 45% Merlot from the estate’s vineyard in St. Helena. The wine has an alcohol level of 14.5%. The bottle is sealed with a natural cork. It was refreshing to sample a couple of wines from the Napa Valley with retrained levels of alcohol. If you missed it above, the 2008 Metamorphosis clocked in at 13.8%. Even though the Transformation is a year younger, it was more open and ready for consumption. If I had both of these wines in my cellar, I’d consume the 2009 Transformation and save the 2008 Metamorphosis for down the road. That said, both wines would be outstanding even today, if served with a moist, juicy cut of beef. Are you interested in attending the Napa Valley Film Festival? The festival runs from November 13 through 17. Oh, almost forgot, how does attending the event for free sound? To celebrate being a sponsor of the event, Benchmark Wine Group is giving away a very nice package to one lucky person. Enter by October 31st for your chance to win. The Napa-based company is offering one lucky winner two Festival Passes to the Napa Valley Film Festival (NVFF), worth a $500 value; two private invitations to the Benchmark Opening Night VIP kick-off party; and exclusive access to the sneak preview screening of ‘August: Osage County’, starring Meryl Streep and Julia Roberts. Benchmark Wine Group will be hosting an exclusive Opening Night VIP kick-off party on Wednesday, November 13 and a winemaker tasting with Todd Alexander of Bryant and Bettina on Friday, November 15. NVFF Patrons and special guests will be invited to join Benchmark Wine Group at the Michael Holmes Gallery at Riverfront, 606 Main Street, from 8 pm to 10 pm Wednesday to launch the week’s festivities. Every guest Wednesday will be entered into a raffle for a chance to buy a bottle of 2001 Château Haut-Brion for $1; taste magnums of 1983 Pétrus, 1966 Château Margaux, and 2003 Diamond Creek; and enjoy food catered by Morimoto Napa. To view the official rules and to enter, click here. A video about the event from my bud, Amy Payne, is available by clicking here.